Take the Merritt Parkway to Exit 42, Westport-Weston. Follow Weston Road (Route 57) north for approximately 3.5 miles, through Weston Center, to a blinking light intersection with the Newtown Turnpike. At this blinking light, bear right onto Newtown Turnpike. (Route 53N) for approximately another 3 miles. 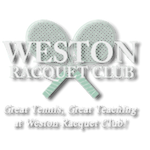 Shortly after crossing Godfrey Road, Weston Racquet Club will be on the right, #405 Newtown Turnpike. (Look for our white logo sign at entrance then continue into driveway and up the hill to the club.) See you on the courts!